Keeping myself occupied today, while my thoughts are elsewhere, I thought it might be fun to mix the sets from the Home and Country Life plates by Artistic Outpost. 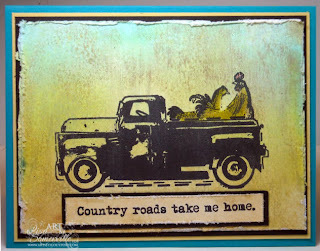 I just love that old pickup truck and thought it might be fun to put some stamped images in the back of the truck. I'm sure this won't be the last time you see me add images to this ol' truck! The background was created using the Pulled Glimmers Technique from the current TJNL. This technique works best of Clay Coated paper, but since I was using a bolder image, I grabbed SU White. I've found the bolder images don't stamp as nicely on the Clay paper. I did stamp the image first, because I'm too impatient to wait for the Glimmers to dry. 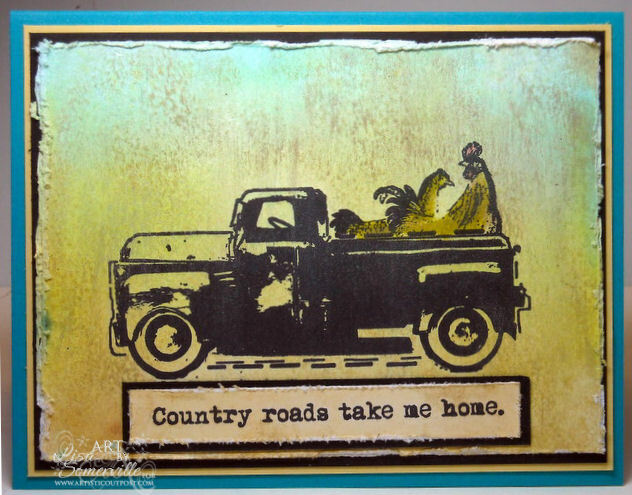 Once my background was complete and the image stamped, I masked the truck with Eclipse tape and added the roosters from the Country Life plate. Added some color to them with Distress Inks and an H20 brush, lightly rubbed on some Old Paper Distress Ink to age my project, then distressed the edges with the Distrezz-it-All. Be sure to stop back late tonight, as I'll be posting my card for this weeks Play Date Cafe, using some "new to me" stamps! Wow, Lisa, this is amazing! You are lightyears beyond me (a simple stamper!) LOL! Clay paper?! Never heard of it! I love how you did the glimmer! That technique is SO cool! Could you do a video on it at some point? Hugs to you! I read your last post, and I'm very sorry for your loss. I couldn't imagine losing my brother. The way you wrote, it doesn't seem like it just occured, but in your heart, I'm sure it seems like yesterday. Lisa this is great, sorry your mind is elsewhere today. :( I love seeing your different techniques you use. Gorgeous card, love the masculinity of that vintage truck! Luv how you combined both these sets....great bg too! That gives me an idea for a Father's Day card for the hubby! Great one, Lisa! This is amazing- and what is clay paper??? I love that stamp set too! Gorgeous BG! Fabulous! I love your technique and that stamp is so vintagey!